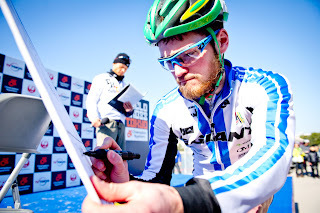 Lewi Rattray's CX Blog: Cyclocross Tokyo! 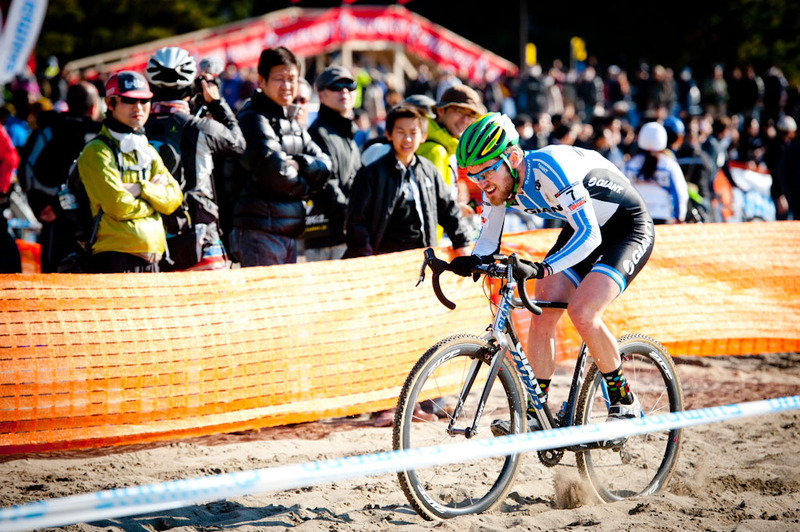 The final stop in my round the world tour of cyclocross is Tokyo, Japan. Japan has a rapidly growning CX scene which has been around for a number of years now. 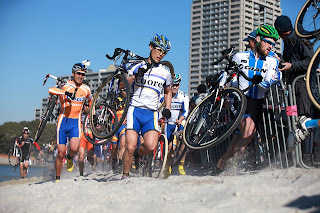 The standard of competition in Japan is very high, their top male and female riders are consistently amongst the top 30 at the world championships and world cup series and often on the same lap as the winners. 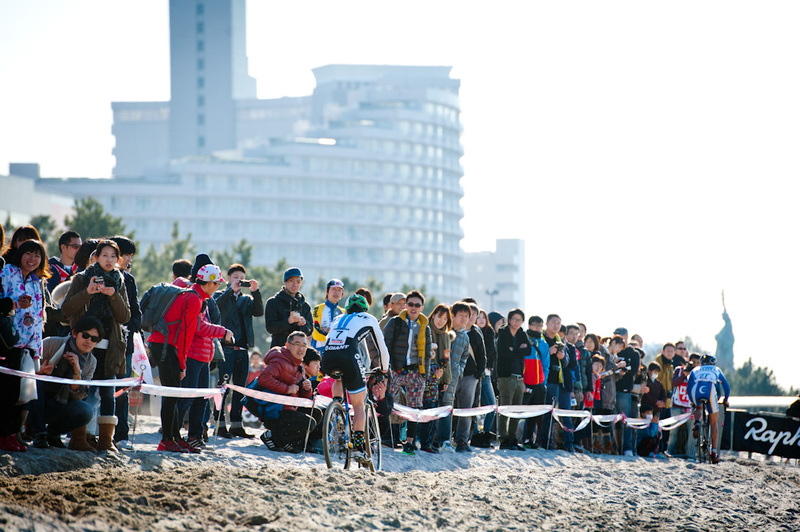 I’ve been to Japan before, but never for a bike race. I was pretty excited, as I’ve had a fair bit to do with Yu, Keiichi and Ayako and the photographer Sonoko whilst racing in Europe. They are refreshingly friendly and always smiling, which was always a welcome change from many of the euro pro’s, who barely acknowledge you exist. 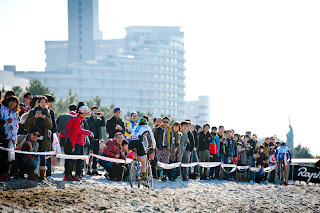 Champion Systems Japan hosted the race on the shores of the bay in the middle of Tokyo. 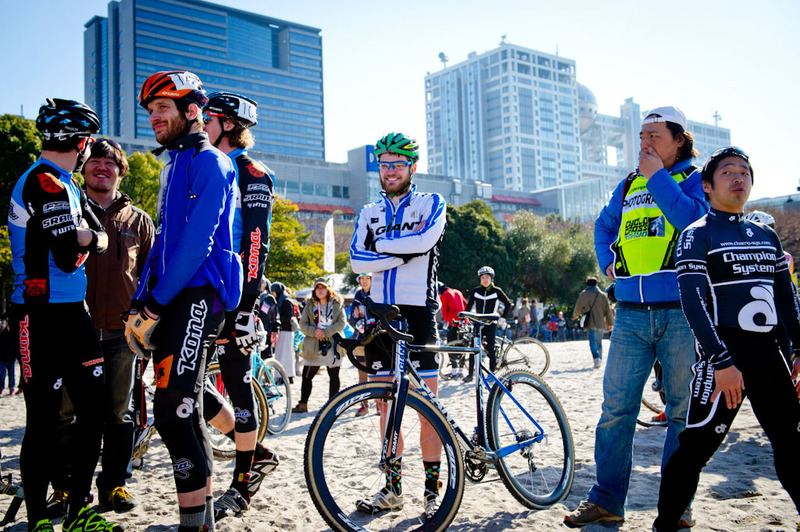 The race is now in its second year, and doubles as a bicycle expo with many sponsors setting up tents with catalogues and demo bikes on display. The organisation behind the event was absolutely outstanding. The guys and girls from Champion Systems arranged everything and provided a select group of riders with flights and accommodation for the few days either side of the race. I was very privileged to be amongst some top name US athletes such as Jeremy Powers, Tim Johnson, Barry Wicks, Spencer Paxson and Erik Tonkin. Half of the course was in a little forest next to the beach, with windy singletrack, barriers, stairs and a purpose built wooden flyover. The other half involved two separate sections of sand, separated by a concrete start finish straight. These were rideable provided you had 100% focus on the right lines, and weren’t interrupted by other riders. 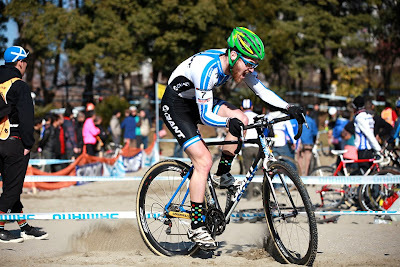 As you can see from the photos, it was a stunning setting for a cyclocross race, easily the most beautiful area I've had the pleasure of racing in. What made it even more amazing was the number of people who showed up. 13,000 spectators came through over the two days of racing, with an estimated 10,000 on race day, pretty impressive for a non UCI race a long way from Belgium! The team from Giant Bicycles Japan also provided me with an enormous amount of support during my stay; picking me up from the airport, and taking me to and from the hotel everyday. Together with employees Shibui, Tomohiro, Takashi and their Marathon MTB specialist Motoshi I was also given a gastronomic tour of Japan at dinner each night. I’m not exceptionally adventurous with food, but I figured I should lash out and try everything, given the opportunity. Some of the culinary stand outs were raw prawn sashimi, sea urchin, flamed sea eel, a Korean style-Japanese barbeque (with amazing marbled beef) and raw squid in soy sauce (the live squid are thrown into the soy sauce!). My supporter cards were a hit with both the employees and fans, I think I gave away all 120 over the weekend! There were many recreations both before and after the race. 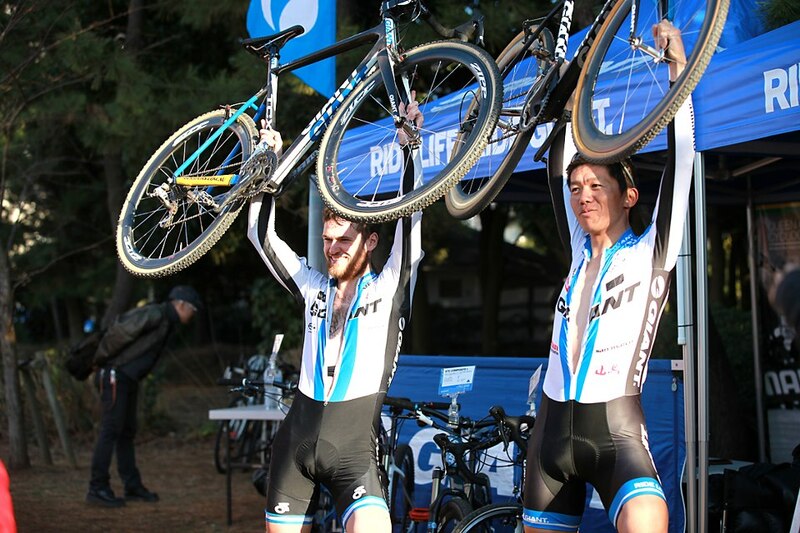 From some of the earlier races, it was evident that the Japanese take to CX in the same relaxed nature that I’ve seen in the US and Australia. There were costumes a-plenty in some of the lower level races! The international riders and top domestic Japanese riders were instroduced to the crowd (which was estimated to be around 10,000!) and signed on after a brief introduction by the MC. 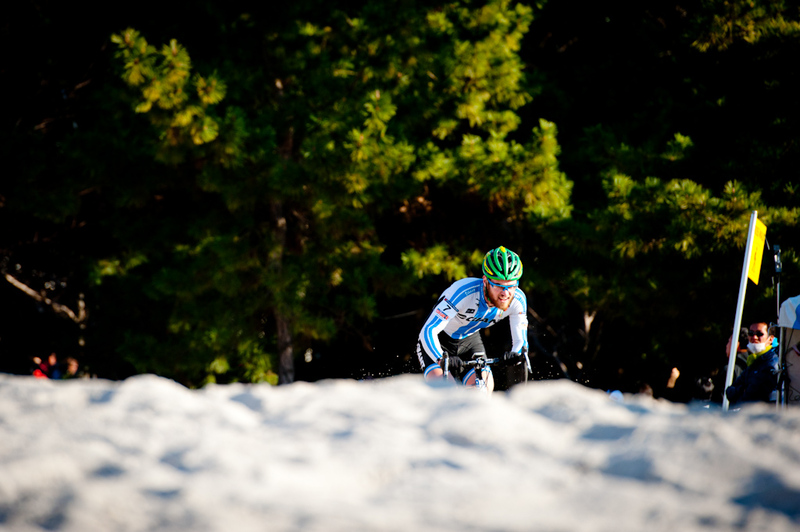 I still feel halfway between a rider and a fan when I’m hanging around the pros. Whilst we were waiting around to be called up to the stage, Jeremy Powers himself made mention of how big my quads were! In my head I was just thinking “play it cool, play it cool!” I’m a big fan and he’s an absolute machine, so it was pretty cool to hear (if only my legs could put out the power I imagine he could put down). I got chatting to the runner up from the National Champs, Hikaru Kosaka. 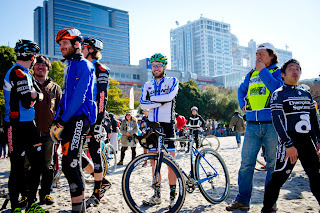 He was the Japanese rider I nearly caught at the finish of our race in Louisville the week earlier. Hikaru’s dad is a legend of Japanese cyclocross, and is still exceptionally fast at 49 years of age. He came 3rd at their Nationals! Given my celebrity status and UCI points I started on the front row, and the gun fired to the theme from Pirates of the Carribean. Off the start I was in an alright position, but as soon as we hit the sand, mayhem ensued, and I was caught amongst a swarm of riders scrambling for the prime section of rideable sand on the left hand side. Through the forest I was able to establish my position, and thanks to some some primary school level Japanese I was able to determine I was in 13th (Ju San). 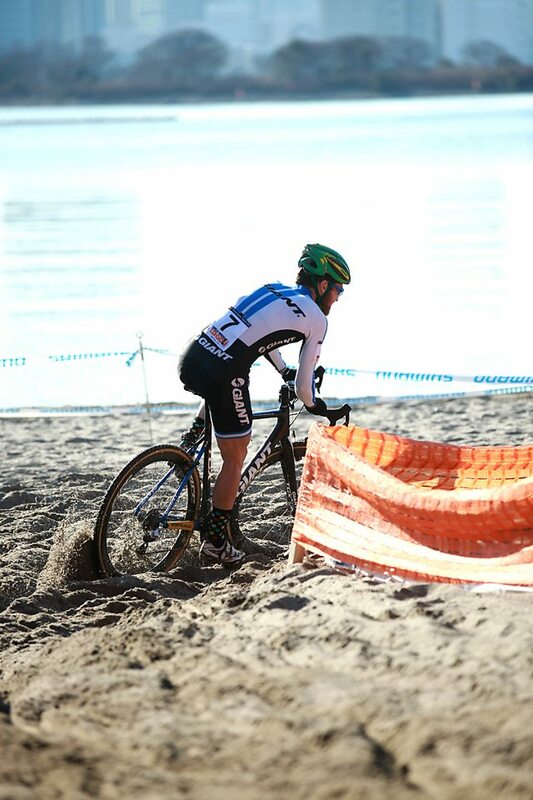 The second sand section was even more difficult, as the rideable section had now been covered in water from the rising tide. This meant that unless you were able to ride exceptionally smoothly and efficiently in the sand (I wasn’t), you’d have to run the 400m until the concrete start finish straight. 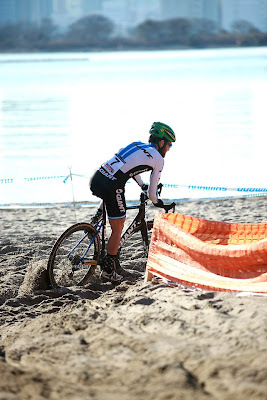 Most of the courses I've raced on involve running sections of around 10secs at a time, however this course involved a total of what I’d estimate to be at least 1min30 of sand running per 5min lap, depending on how much of the sand you could ride. This was too much for my poor body to handle, and at around 30 mins in (around the same time as my mum and sister arrived, fresh from skiing powder in Niseko), I felt the familiar pinch of cramps in my calves and hamstrings. 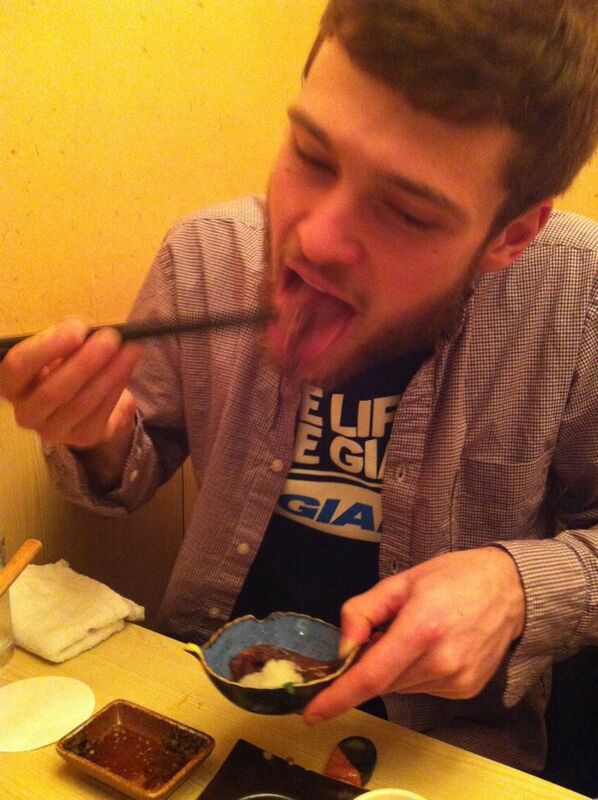 Yasutami snapped this shot of me mid cramp! Before long, I was cramping in every major muscle of both legs. It got so bad that a number of times I actually had to stop and stretch them, only for the opposite muscle to seize up. I was screaming in pain and laughing at the same time, plenty of the spectators were laughing as well and I’m pretty sure I even cried a little bit, it hurt that badly. 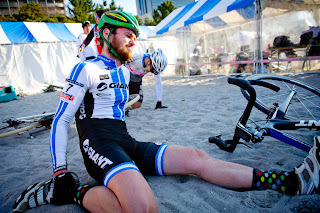 From then, my position in the field started falling, and a crash with another rider, that dropped my chain and unhooked my rear brake meant that I lost significant time to the leaders. After about 40mins, Yu Takenouchi came flying past me with a lead of about 10 seconds over Powers and Johnson. Despite the roar of the crowd in support of the hometown favourite, Powers ended up winning, to Yu in second and Johnson in third. I ended up 2 laps down in 19th position, struggling to walk and breath, but managing a smile, grabbing a few high fives and plenty of cheers from the crowd in my last few laps. 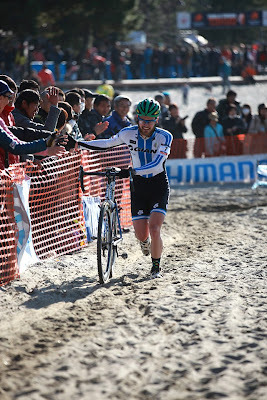 I was hoping to be a little higher up on the results from this race, perhaps top 10 or top 15. I certainly won't look back on it and be disappointed, but I'd love to come back for some more races and see whether I can't hit the top 10 in some of the November UCI races. This is easily one of my favourite places in the world, so I'd love to come back. Stretching out my cramping 'everything' across the finish line. It’s been a ridiculously long season, from New Zealand Nationals last July until February in Tokyo and I’m looking forward to relaxing with friends and family back home for a week until I take off for a pre-holiday through Europe before starting a uni exchange in Berlin. Thank you for following the blog, for the messages of support on social media, in the comments and obviously in person. It has been the most amazing experience, and I am exceptionally grateful for the opportunities given to me. The trip would not have been possible without my generous sponsors, in particular my primary supporter Giant Bicycles Australia but also my associated sponsors: Sram Australia, Zipp Speed Weaponry, Adidas Eyewear, 4Shaw, Champion Systems, , Creux Cycling Streetwear, Paul from FMB tyres, Ozriders, Sports2 Nutrition and Qoleum Sportscare. I also have to thank the many people who helped out in Belgium, the US and Japan, providing accommodation and transport to make the logistical nightmare a walk in the park. I will be forever indebted to Roeland and Jeroen, who gave me an amazing amount of support during my stay and their family, girlfriends Rose and Ellen and friends all helped to make sure I was fully supported at the races and had a home away from home during my stay in Belgium.